SAILKARMA.COM - Sailing News, Videos and Photos! : In the bag... E4 wins the Volvo Ocean Race! 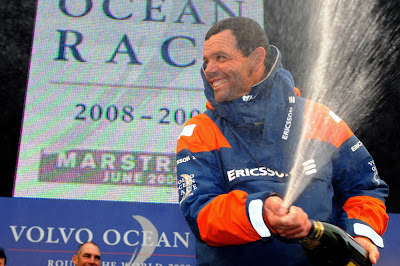 Barely one year after Ericsson 4 was launched skipper Torben Grael and the International crew clinched overall victory in the Volvo Ocean Race 2008-09 when they brought her home to Stockholm in third place on Leg 9. Ericsson 4 has amassed 108 points and has a 13-point cushion over second place with only 12 points left to be won. “Now it’s done. It’s finished. It’s a fantastic feeling,” said Grael. Ericsson 4 finished Leg 9 about 14 minutes behind teammate Ericsson 3, which took second on the leg that began in Marstrand. Skipper Magnus Olsson and the Nordic crew were thwarted in their attempt to win into Olsson’s hometown by a mere 90 seconds. The race village at Skeppsbron is hopping this week, with activities running daily until midnight. Sunday will see the Stockholm In-Port Race, Monday the Pro-Am and next Thursday, June 25, the final leg to St. Petersburg, Russia, begins off Sandhamn.